On Sale Now! Free Shipping Included! Save 3% on the Wifi Smart Switch, Wifi Light Switch 2 Packs, Works with Amazon Alexa and Google Home, App Remote Control with Timing Funtion, No Hub Required (Neutral Wire Required) by Lesim at N Online Agency. Hurry! Limited time offer. Offer valid only while supplies last. Features: 1. Wi-Fi Enabled Smart Light Switch, Control your lights from anywhere 2. Hands-free lighting control with Amazon Alexa and Google Home 3. 1. Download the "Smart life" from App Store or Google Play store. 2. Connect your mobile device to your 2.4GHz Wi-Fi network. 3. Launch "Smart life" and follow the wiring steps provided. 4. Connect the Smart Switch to your home network. 5. If you don't know how to install the switch, or don't know how to connect to wifi or Alexa, please feel free to contact us. 1. Live wire and neutral wire are required. 2. We recommend asking professional electrician to install. 3. Support 2.4 GHz Wi-Fi Only. 4. WiFi name and password should only contain letters and numbers. No special symbols allowed. 5. Our switch is one-way switch, can't be compatible with 3-way switch box. 【Touch Control】The wifi light switch is with capacitive touch control, turn on/off your light at a single touch. New design with scratch resistance glass panel, gives the best look to blend with any wall design. 【Voice Control】 Compatible with Amazon Alexa (Echo/Dot/Tap) ,Google Assistant, IFTTT. 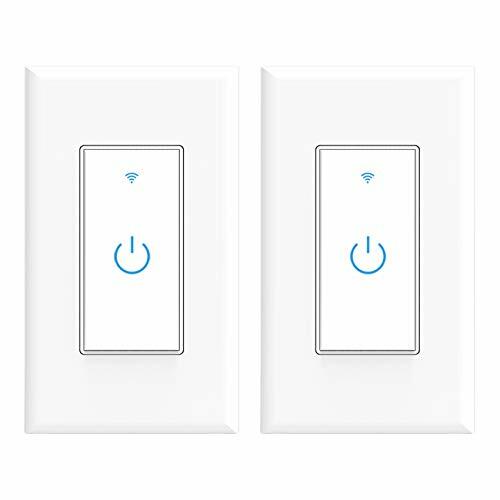 Pair Light Switch with Amazon Alexa or Google Home to turn your lights on or off with your voice. No Hub required. 【Remote Control & Time Set】Control your lights from anywhere. Secure control using the Smart Life App when you are home or away. Custom schedules and set times, let your lights function automatically. On at sunset, off at bedtime. 【Easy Installation】This smart light switch can replace any single-pole light switch. Not compatible with 3-way (multi-switch) lights. Neutral wire required. Not designed to work with metal face plates. Support 2.4GHz Wi-Fi Only (Not support 5G GHz Wi-Fi). 【Safety Guarantee】 CE/FCC/RoHS/ETL certified, overloading and overheating supported for your safety. We do guarantee 100% customer satisfaction. If you have any problem, please contact us by checking Your Orders and clicking Contact Seller. If you have any questions about this product by Lesim, contact us by completing and submitting the form below. If you are looking for a specif part number, please include it with your message.